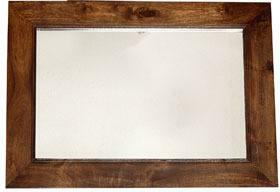 This mirror stands out because of its distinguished wooden frame. The wood used is solid mango, which imparts a nice a nice quality to the piece. The grain of the wood shows through and will be a good accent for your home. The frame itself is wide and long. That ensures that this mirror will catch your eye as soon as you walk into the room. You are bound to receive compliments on it from friends and family. The wide viewing area of the mirror means you'll have plenty of space to catch a reflection. This piece will be a nice addition to any dining room, living room or bathroom.